Microsoft’s Arc Mouse is rather one of the better looking mice on the market with a unique design and slick build. With curvature for optimal comfort, a foldable design for travel, and wireless connectivity, the Arc Mouse aims to reach the hands of many users at an affordable price. If you are on the go, a laptop’s touchpad doesn’t always get the job done. While portable mouse comes handy, does Microsoft’s Arc Mouse live up to the claims or is it just a waste of well-earned cash? The “arc” design, hands down, makes this device stand out against competition. The rear portion of the mouse folds into itself becoming only 60% of the original size, which is great for travel. Fortunately, when expanded, it’s large enough to rest your entire hand. 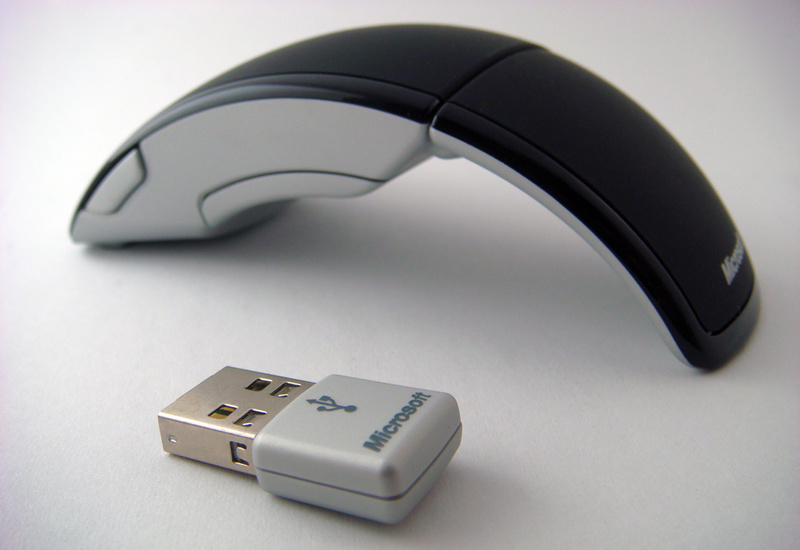 The USB transceiver stows away under the mouse and is held in place magnetically. 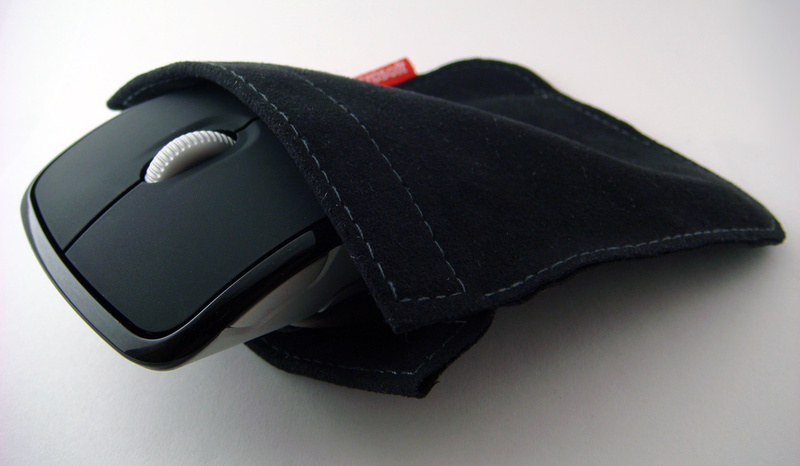 When folded, the mouse automatically shuts off to save power and fits into the included travel sleeve. The transceiver is unfortunately quite larger than the one found on Microsoft’s Mobile Mouse 4000. I wouldn’t suggest leave it plugged in when transporting as it will likely snap or damage a laptop’s USB port. As for the mouse, despite appearing a bit flimsy, it’s actually quite sturdy with little to no flex even when exerting pressure. 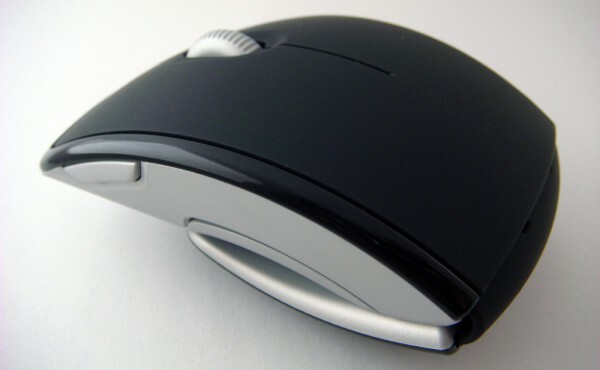 The Arc Mouse is light enough for travel, but weighs enough to overcome possibly appearing cheap. In terms of hardware, there’s not much except for the standard left and right-click, a scroll wheel, and a ‘back’ key. Asides from that, the mouse is available in Red, Purple, While, Blue, Green, and Black. Some colors are also available in glossy editions, however I wouldn’t recommend those as they’ll likely be fingerprint magnets. 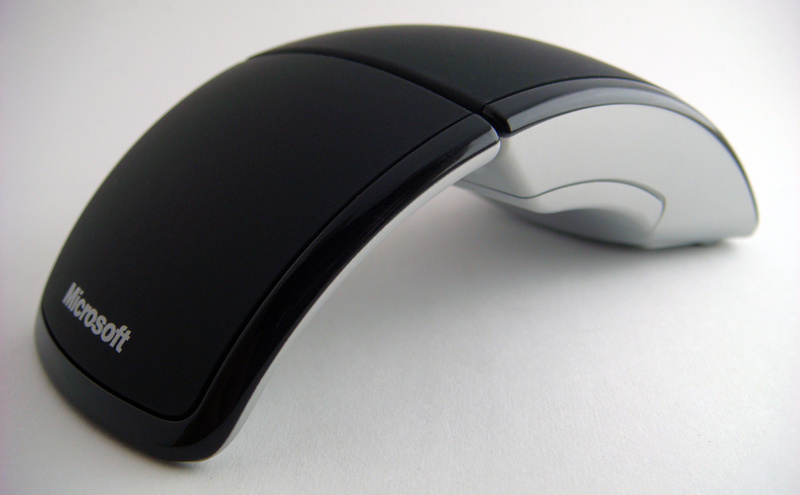 The curvature offers the comfort of desktop mice while the symmetrical design will allow for ambidextrous use. While the scroll wheel and left/right-click have a comfortable feel, the ‘back’ key on the front left side isn’t within reach of the expected position of your thumb. I found myself awkwardly reaching forward to press the key. The flawed positioning will be further irritating for left-handed users as they’ll have to use a pinky to reach it. Unfortunately, the Arc Mouse also lacks an additional ‘forward’ button which is even more disappointing. Despite that, the mouse still offers a great grip with a rubberized matte finish and slides smoothly over most surfaces with durable Teflon pads. The Bluetrack sensor is a step up from most laser mice as it can track on a variety of surfaces including glossy magazines. It’s still a step behind the Darkfield technology found in Logitech’s MX Anywhere that even works on glass. For the most part, the sensor is precise and responsive enough for most tasks even over a wireless 2.4 GHz connection and should meet the need demands of most consumers. The functionality of the Arc Mouse and Mobile Mouse 4000 are nearly identical. As both have left and right-click, a scroll wheel, and a side button, the only difference is the shape. After plugging in the transceiver, Windows 7 automatically fetches the latest IntelliPoint software from the internet. All the keys work right out of the box and installing the program isn’t required, however the software allows for further customization. The program’s user interface is quite friendly and let’s you visually pick different actions per component. For example, the scroll wheel can initiate the 3D flip for Windows Vista and 7. While on the topic of the scroll wheel, I should mention that it’s a “notched” type. There’s no free scroll or flick mode available. It works fine, but including that mode and maybe even a ‘forward key’ would have gone a long way to improve functionality especially since IntelliPoint offers plenty of custom settings. I was also glad to see a simple power indicator on top which changes colors as it gets closer to running out of power. With power conserving standby feature, Microsoft claims a six month lifespan on two AAA batteries. While I can’t testify to that claim, it’s been running at full power for the past two weeks. When it comes down to it, Microsoft’s Arc Mouse offers a lot for its price tag. But, is it enough? Unfortunately, I definitely feel it looses value since it lacks a ‘forward’ key and since the positioning of the ‘back’ key renders that function useless. On the bright side, it offers the comfort and feel of a larger desktop mouse and even folds away for transport. Microsoft’s Bluetrack technology is likely the second best on the market and will work on most surfaces. If you are looking for a companion for your netbook or laptop when you travel, this will get the job done. It’s available for around $40 while some colors are even cheaper if you shop around. And if you didn’t browse through the images, it’s actually one of the better-looking mouse out there. While it does lack on some features, the Microsoft Arc Mouse won’t disappoint. Wow I like it. That is a unique mouse and I will try this one too.